The search for the killer continues as it leads to a gruesome crime scene in a church. Bax and company continue to be one step behind the vicious murderer who's unaffected by the toxic scorching rays of the sun. They were able to wound him when they last met and the blood sample could lead to some answers. 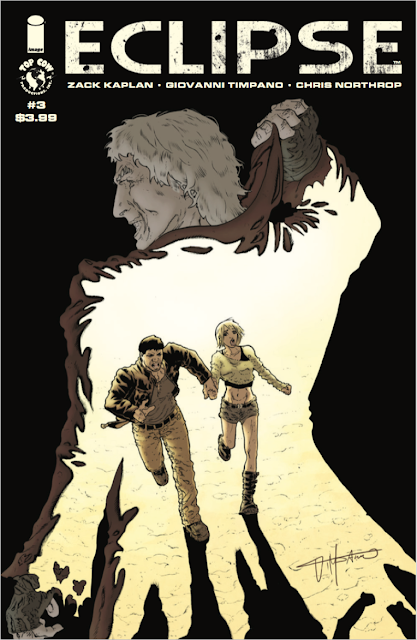 'Eclipse' #3 goes full crime procedural as investigators search through the killer's lair, full of pictures of his intended victims. Cielo, the high profile girl he protected earlier, tries to convince Bax she can help find the killer especially if his targets are the affluent offsprings of corporate big wigs. It's a dense immersive read, one that covers a lot of ground introducing new characters but is paced well, keeping the action and dialogue moving. Bax and 'Eclipse' remind me a lot of 'Blade Runner.' A brooding detective in a cruel world (this one unyieldingly bright and hot instead of dark and gritty) trying to track down a person with the help of a woman. The world building here is no less ambitious than 'Blade Runner' and penciler Giovanni Timpano is audacious in his approach, providing an intricate amount of detail above and below ground. Timpano and Kaplan are one impressive voice. Cielo shows some character growth as a willing partner to Bax. She's beginning to evolve from the spoiled party girl trope to more of a Nancy Drew. There's a good dynamic between Bax and her that is father-daughter-like but begrudgingly on his part. There are some new twists, some very dark, that propels the issue escaping the pitfalls of many third chapters of new books. A lot can be determined, often make or break for a new title, by the third issue. Kaplan and company reveal just enough to reward readers while establishing new story threads. I can't mention the wonderful art without applauding Chris Northrop's colors. Honestly, the story falls apart if the threat of being vaporized by mere sunlight isn't convincing. Northrop applies some brilliant yellows and whites that convey perfectly the dry scorching heat. The resulting destruction of the human body looks justified because Northrop weaponized the sun with his deliberate color work. Part mystery, part monster tale, and all science fiction, 'Eclipse' keeps getting better as Kaplan unfolds this dystopian detective story. With Timpano and Northrop on art, it's easy to imagine a future so dangerous and unforgiving. This latest chapter advances the series while further developing its characters while making the villain even more formidable than before. Make sure to add 'Eclipse' to your pull list so you don't miss this winner.